The internally initiated bidirectional replication of linear replicons of Streptomyces encounters a classical problem of dealing with the gaps at the 3' ends of the replicons, which cannot be replicated by the replisomes. Chang et al. (1994) determined the size of the 3' overhangs during replication of pSLA2 plasmid to be about 280 nt. The sizes of the 3' overhangs of other linear Strep-tomyces plasmids and chromosomes have been found to be similar and range from 250 to 320 nt (C.-H. Huang, unpublished results). Unlike the telomeres of eukaryotic chromosomes, which are heterogeneous in size because of variable extension by telomerase, the telomeres of Streptomyces linear replicons have fixed sequences. Therefore, the 3' overhangs of Streptomyces linear replicons must be patched during replication. Several biochemical mechanisms for end patching were originally proposed (Chen 1996). These models center on the role of the TP, which must end up attached covalently to the first nucleotide at the 5' end. There are two possible mechanisms that may account for this result. Firstly, TP may nick a double-stranded intermediate and remain covalently linked to the 5' end at the cut site, similarly to the action of many nickases, topoisomerases, and recom-binases. Secondly, TP may act as a primer for DNA synthesis that fills the 3' gaps. Such a primer function is seen with the TPs of ^29, adenoviruses, and other related linear replicons. In this regard, the amino acid sequences of TP do not resemble any known nickase or primer TP in other systems. TP as a nickase has no experimental support. No nuclease domain is found in the Streptomyces TP sequences, and no DNA nicking activity has been detected with any Streptomyces TP. The simplest model involving TP as a nickase is analogous to the "rolling hairpin" model for replication of helper-dependent parvoviruses (Kornberg and Baker 1992), in which the terminal palindrome folds back and provides a primer for the end patching, followed by nicking by TP and fill-in synthesis that restores the telomere. This model predicts that each round of replication will flip the terminal palindrome once, and therefore the terminal palindrome would exist in two opposite orientations among the population. Testing this flip-flop model with an artificially constructed pSLA2 derivative, Qin and Cohen (1998) ruled out this model. The complicated "modified rolling hairpin model" (Huang et al. 1998) involving TP as a nickase is based on the asymmetric resolution model for autonomous parvovirus replication, which avoids flip-flops of the terminal palindromes (Astell et al. 1985). 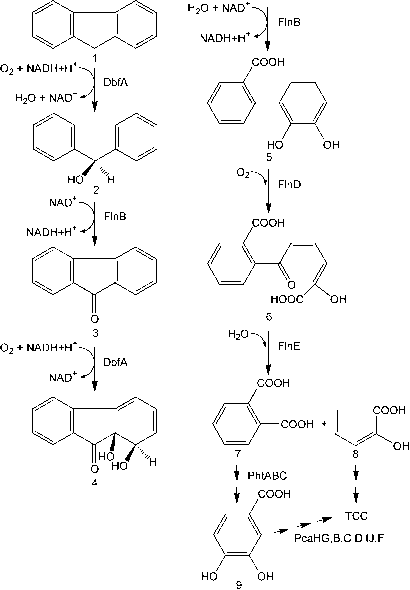 This model is also disfavored by the failure to detect the proposed intermediates (Huang 2002). Currently, TP-primed DNA synthesis models are favored and there are two versions (Fig. 3). In the straightforward version, TP-primed synthesis takes place at the 3' end in the secondary structural complex formed by the singlestrand overhang (Fig. 3a). A second model involves two steps: DNA synthesis followed by recombination. Firstly, a TP-primed synthesis takes place at the fully duplex telomere resulting from leading strand synthesis, which displaces the 5' strand in the process. The displaced 5' parental strand with the attached TP then anneals with the exposed 3' overhang, forming a half Holliday junction, which is subsequently resolved by a resolution system (e.g., the RuvABC resolvasome; Fig. 3b). Fig. 3 Two models of end patching involving TP-primed DNA synthesis. a TP-primed synthesis on the 3' single-strand overhangs. b TP-primed synthesis on a double-strand telomere followed by homologous recombination. The parental DNA strands are represented by thick lines, and the daughter strands by thin lines. The TP on the parental DNA is depicted by open circles, and the new TP by filled circles. The open arrows represent the DNA polymerase that catalyzes the TP-primed synthesis. The Roman numerals indicate the first four palindromes at the telomeres. See text for detailed descriptions involved in the end patching of Streptomyces chromosome (and thus also of linear plasmids). While all the recA mutants exhibited an expected increase in sensitivity to UV and mitomycin C and blocks in chromosomal recombination during conjugation, one pair of mutants displayed recA-independent recombination during conjugation, even when both parents were recA mutants. It still remains possible that the recA-independent homologous recombination is involved in end patching. The recombination model was rejected by Qin and Cohen (1998) based on a lack of homogenotization between the two nonidentical terminal sequences of a linear plasmid, which is expected if recombination occurs between the two telomeres in each replication cycle. However, this study concerns only recombination between the telomeres on opposite ends, and therefore has not ruled out recombination between telomeres at the same end of the sister molecules, as proposed in the original model. Therefore, the recombination model is still valid as a working hypothesis. Regardless of whether homologous recombination is involved or not, TP-primed synthesis is the key step in both of the end patching working models. The key players in this reaction are the TP (Tpg or Tpc), Tap (or a functional homolog for the SCP1 system), a DNA polymerase, and the DNA template. In vitro deoxynucleotidylation of TpgSco has been established recently using crude extracts of Streptomyces harboring a high-copy-number linear plasmid (providing necessary enzymes and template) and Escherichia coli (expressing TpgSco). In this system, dCMP is specifically incorporated onto a Thr residue present in TpgSco (Yang et al. 2006). This differs from the situation of ^29 and adenoviruses, in which deoxynucleotidylation occurs at a Tyr residue. A phospho-Thr linkage is alkali labile. The TP that caps Strep-tomyces linear replicons is readily removed at alkaline pH (Lin et al. 1993). Both TpgSl1 and TapSh bind to DNA in vitro, as expected from their sequences (Bao and Cohen 2003). TpgSh exhibits no sequence specificity, whereas TapSli interacts strongly with single-strand telomeric overhangs at regions corresponding to Palindromes II and III. Immunoprecipitation and yeast two-hybrid studies indicate that TapSli interacts with TpgSli in vivo. This leads to a model that Tap positions at a specific region of the 3' overhang and recruits Tpg to the telomere for end patching (Bao and Cohen 2003). Using TapSco as a scaffold, Bao and Cohen (2004) isolated several telomere-binding proteins from S. lividans, including DNA polymerase I (Pol I) and topoisomerase I. Interestingly, they discovered reverse transcriptase activities in both proteins. In view of the fact that the DNA-binding domain in the Tpg proteins also resembles the thumb domain of the reverse transcriptase of HIV, this discovery is intriguing. However, there is no simple model for the involvement of reverse transcriptase activity in end patching, which would require a RNA version of the telomere sequence for the template. The biological significance of the reverse transcriptase activities remains obscure, and a simple model of end patching involving a reverse transcription step remains to be envisioned. The template requirement for end patching of pSLA2 was examined by Qin and Cohen (1998). The minimum length of the telomere necessary for end patching in vivo was determined to be 144 bp, which spans the first six palindromes. However, not all the 144 bp are required. For example, Palindrome IV, but not Palindromes II, III, and V, may be removed without affecting viability. Using a recombinant plasmid to study the S. lividans telomere sequence that is shared by the right end of SLP2 and the S. lividans chromosome, H.-H. Tsai (unpublished results) found that Palindromes IV to VII may be deleted without affecting replication of the linear plasmid. The lack of Palindrome IV makes the pairing of Palindromes I and IV impossible (Fig. 1b) and, in the predicted secondary structure of this shortened sequence, Palindrome I instead forms a stem-loop by itself. This result indicates that the pairing of Palindromes I and IV in the predicted optimal secondary structure is not essential. In this regard, the 3' end of the SCP1 telomere is single-stranded in the predicted secondary structure (Fig. 1c). The minimum length requirement for the SCP1 telomere determined so far is only 84 bp, spanning the first three palindromes (C.-H. Huang, unpublished results). Shiffman and Cohen (1992) showed that functional linear plasmids can be produced when a replication-proficient linear plasmid sequence containing telomeres bracketed by adventitious DNA is introduced into Streptomyces. The technique has since been widely used to construct recombinant linear plasmids. The success of this procedure indicates that in vivo end patching may be achieved on an internal telomere DNA sequence that is not capped by a TP. This suggests that the presence of TP caps on the parental DNA during replication is not a critical signal, but the telomere sequence alone (even if it is internal) is sufficient to be recognized as the template for end patching. merase I (Pol I). Bao et al. (2004) found that Pol I was associated with the Streptomyces telomere complex, and polA could not be deleted from either a linear or circular chromosome without affecting viability. However, more recently, complete deletion of polA was achieved in certain strains of S. coeli-color (Huang and Chen, manuscript in preparation), and cell extract prepared from the polA null mutant remained competent in supporting in vitro de-oxynucleotidylation of TpgSco (Yang et al. 2006). These results suggest that either Pol I is not involved in end patching or it may be substituted by another polymerase. A close homolog of polA (SCO3434) is present in the S. coelicolor chromosome. However, a chromosome with double knockout mutations in polA and SCO3434 remains linear. This rules out the possibility that SCO3434 may substitute for polA in end patching. In E. coli, DNA polymerase II (Pol II, encoded by polB) can substitute for Pol I when performing fill-in synthesis during replication and repair. However, no polB homolog is present in any sequenced Streptomyces genome. Flett et al. (1992; 1999) showed that replication of the Streptomyces chromosomes requires a DnaE-type Pol III enzyme (dnaEl). Interestingly, duplicate copies of genes encoding some subunits of Pol III are present in all sequenced Streptomyces genomes. There are two genes for the catalytic subunit a (dnaEl-2) and clamp subunit P (dnaNl-2), and three genes for the 3' ^ 5' exonuclease subunit e (dnaQl-3). Similar duplication of Pol III subunit genes is also seen in most other actinomycetes with circular or linear chromosomes. It is not clear whether one of the Pol III holoen-zymes is involved in end patching. Genes encoding a polC-type a subunit, present in low G+C gram-positive bacteria, have not been found in Streptomyces genomes. Of the error-prone translesion repair DNA polymerases, Pol IV-encoding dinB is present in two copies, but Pol V-encoding umuC is absent.